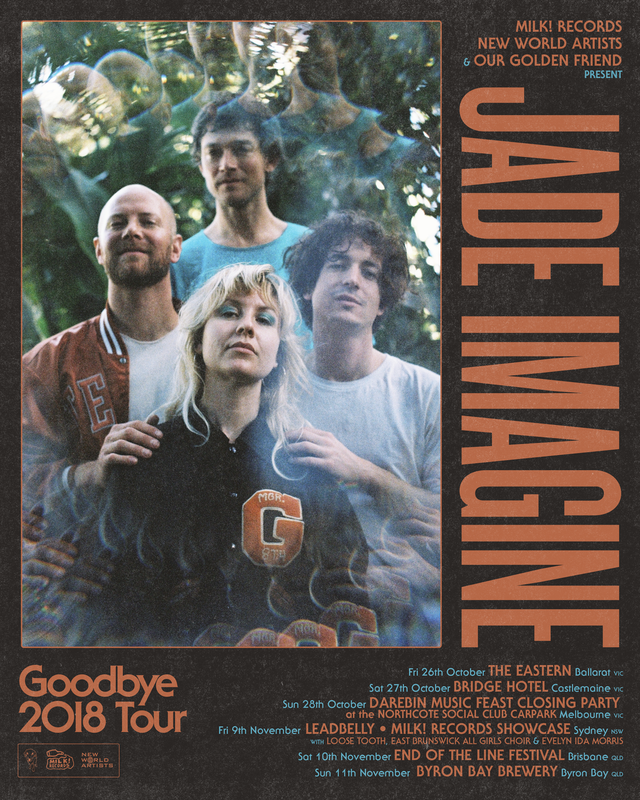 Jade Imagine, fresh back from a run of stellar shows at BIGSOUND in Brisbane, are excited to announce their Australian End Of Year Tour to say goodbye to 2018! As part of the tour announcement Jade Imagine are excited to share that they are the very first band to be announced as playing Brisbane's End of the Line Festival to be held on Saturday the 10th of November. The End of the Line Festival is a free street festival which aims to showcase and celebrate the unique Brisbane precinct of Woolloongabba. Keep your eyes peeled for the announcement of the rest of the lineup which will follow next week. With new music on the horizon, Jade Imagine (presented by Our Golden Friend, New World Artists and Milk! Records) will perform shows throughout October & November up and down the east coast of Australia including stops at regional centres including Ballarat, Castlemaine & Byron Bay. In Melbourne the band will play a free show in the car park of the Northcote Social Club for the Closing Party of the Darebin Music Feast. Sydney-siders are in for a very special treat as the Milk! Records family pack up their van and hit the road bound for Leadbelly on Friday 9th of November where they will host a Milk! Records Showcase featuring Jade Imagine, East Brunswick All Girls Choir, Loose Tooth & Evelyn Ida Morris.